FERRARIO - [ Pacific Palau Island Bay ]. FERRARIO, G. - [ Pacific Palau Island Bay ]. [ Pacific Palau Island Bay ]. - FERRARIO, G.
Title : [ Pacific Palau Island Bay ].. Size : 7.1 x 9.6 inches. / 18.0 x 24.5 cm. 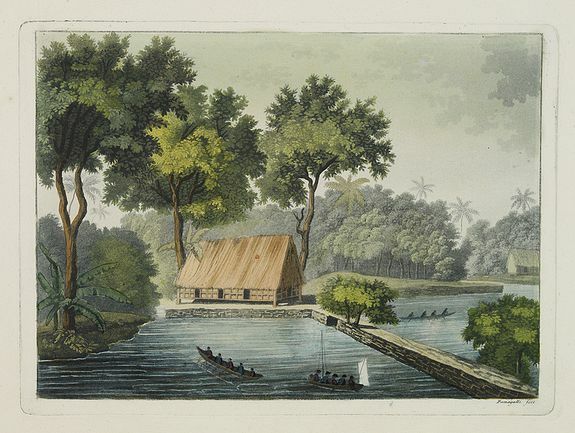 Description :Aquatint depicting Palau Island Bay engraved by Fumagalli. Plate N° 76. The English Captain Henry Wilson shipwrecked off the island of Ulong in 1783. Wilson dubbed Palau the "Pelew Islands".